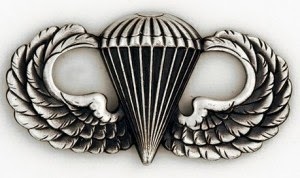 Maybe it's related to starting a long-needed vacation but it suddenly dawned on me that it was exactly 25 years ago this August that I completed the US Army Airborne School. Not only does it feel like a lifetime ago, it really was! As I started going through some unpacked boxes this week (yes, I know we've lived here for five years), I stumbled on an article my college roommate/fraternity brother Paul Jarvis and I wrote for the "Greek Gazette" section of the Tufts Daily chronicling our experience. Dated December 7, 1989, the article on yellowed newsprint is actually pretty funny. You get a sense of what we went through to earn our Airborne Wings but more amusing to me is the hint of Young Turk-like arrogance and the wry tweaking of the whole system. This doesn't really qualify as an archival discovery of great worth but it was fun to come across this piece of my past and to think about a memorable three weeks spent in the sweltering Georgia heat a generation ago. blue yonder, you just haven't lived. Or maybe you're lucky. 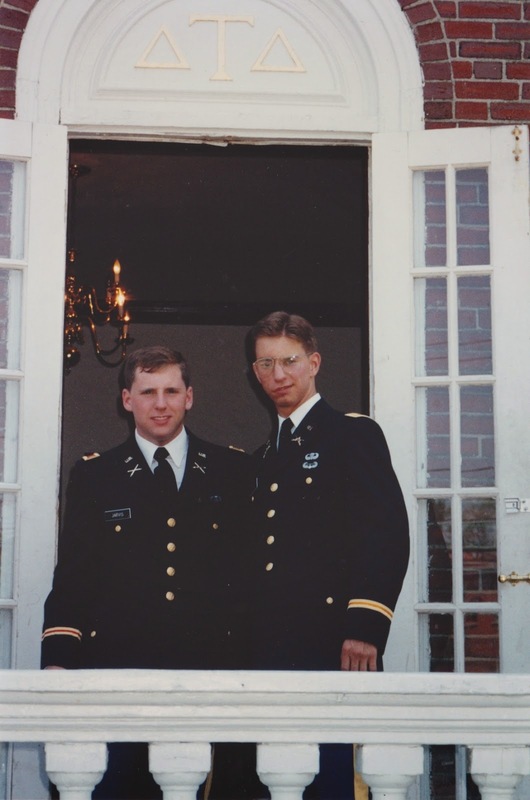 As Army ROTC cadets, both of us were fortunate enough to have a chance to attend Airborne training at lovely and scenic Ft. Benning, Georgia. And, we like to think that we've started a new trend at the Delt House. 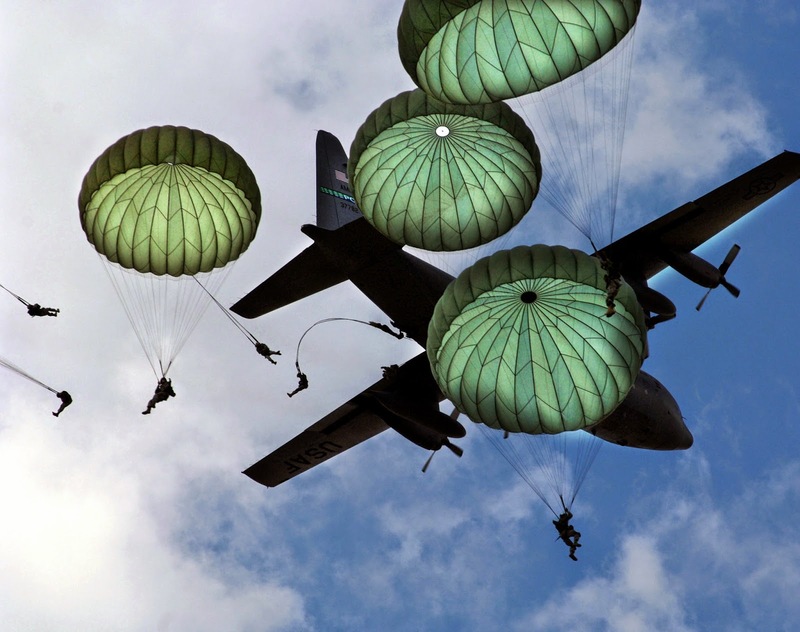 Beginning with DTD alumnus Lieutenant Jon Lidz ('86), we are the second and third Brothers to put our knees to the breeze and qualify as U.S. paratroopers. As with most giant bureaucracies, the Army divides its training into distinct phases. At Airborne, the first week is known as Ground Week. The toughest week of training, Ground Week teaches the aspiring paratrooper how to properly execute a PLF, or parachute landing fall for you civilians. In addition, students learn the correct method of exiting an aircraft through training on the infamous 34-foot tower. Training on this apparatus allows students to confront their fear of height for the first time. After mastering exits and the PLF, cranking out thousands of pushups, and enduring verbal abuse from the caring Airborne instructors, you are ready to advance to Tower Week. During Tower Week, more advanced PLF techniques are masters on the Swing Landing Trainer, or Slam Dunk. Suspended by harness, students are dropped to the ground by an instructor from a height of 4 to 8 feet off the ground. At this point, if you haven't mastered your PLF, you lose. Later in the week, if you've survived the Sam Dunk, you enjoy your first free fall off the mighty 250 foot tower. This final exercise instills confidence in your equipment and landing technique. Finally, Jump Week arrives. The only thing standing between you and the coveted Airborne Wings are five qualifying jumps from a C-130 or C-141 type aircraft (while in flight). You never forget your first jumps. Though impossible to describe the feeling, we'll do it anyway. Close your eyes and imagine the inside of an aircraft. Remember, this is a military flight -- no stewardesses, movies, or complementary beverages (though a barf bag is provided). Now, listen to the engines roar. You can barely hear yourself think; the noise is deafening. The jumpmaster motions for your group to stand up. Suddenly, reality hits you. You are about to willingly fling yourself out of a moving aircraft. Are you crazy? Don't answer that one. deploy. Considering that your body is traveling at 140 miles per hour, it is an odd few seconds. You hear the violent noise of the plane, the heat of the prop blast, and feel your body flying vertical to the ground. If you're lucky, your chute will open and you can enjoy the ride. It's a quick one though, and you had better be ready to execute a PLF because the ground comes up awfully quickly. 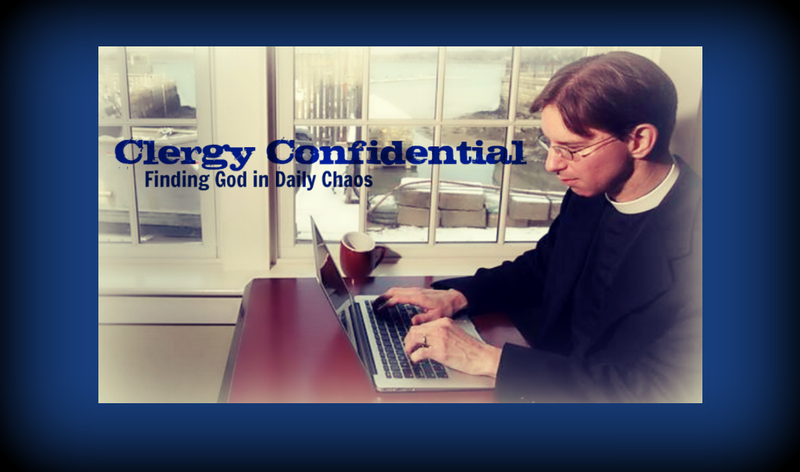 Do this a mere four more times, and you've got your wings. Airborne School was definitely an experience. You do more pushups, get yelled at more often, clean more more barracks, and shine more boots than anywhere in the free world. If you ever want to hear some Airborne war stories, we have plenty of them. So stop by, you know where to find us. AIRBORNE! What's fascinating and not all that surprising -- other than how hunky you look in a uniform -- is how your writing style is absolutely your style and your voice. Delightful and edgy then, even more so these days. And I would do it again tomorrow. Airborne.